I don’t really like dogs, I hate them but not as much as I hate snakes (and other reptiles). I panic when I hear a dog barking, they’re scary. You can’t blame me because, as far as I can remember, I was bitten by an askal twice before, on the same exact spot, while playing with my friends. I even jumped around a bamboo post to escape from another bite. And there were several instances when dogs ran after me. So yeah, I have a lot of unforgattable scary dog moments, when I told my friends I want to raise a puppy, they thought I’d just let it die from hunger and beatings LOL because really, I have very little compassion for dogs. Well, puppies are not exactly the same as dogs you know. I like puppies better, I can tolerate them. I want a cute fluffy puppy that doesn’t bark (ok, very silent bark will do) and bite but can eat, walk, run and roll over LOL. When I read this news at inquirer, awwwww, I am no dog lover myself but this cruelty is just too much. 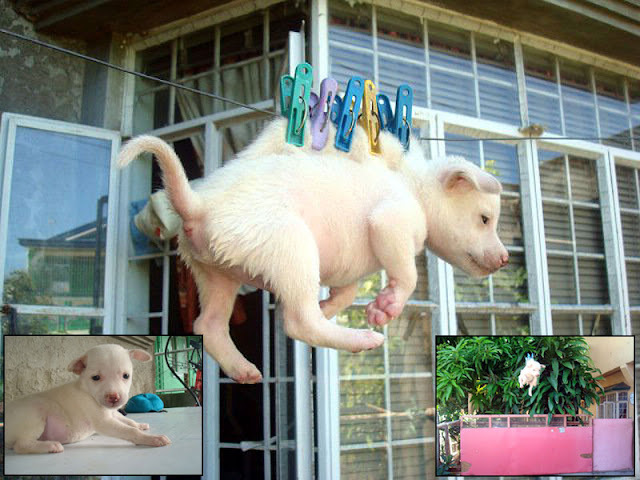 The kid who posted this on his FB wall thought it’ll be cool to hang his puppy like this to dry after bathing. Whaaaaat?!! Kawawa naman, I can totally feel the pain. And I pity the kid who did this, he received a massive hate response, experienced being harshly ridiculed and criticized nationally! That’s surely a hard way to learn a lesson. So let’s all be careful with what we post online. Any comment, picture etc. can all be used against us.